We were reading a review of The Colony Grill Room by Giles Coren in the Times today, the new hotel restaurant at the Beaumont Hotel. This is the latest venture of Jeremy King and Chris Corbin [see the post on J Sheekey] and, if the reviews are true, then there’s nowhere else to eat in London. Especially if you’re after the trifle. If you’re a Times subscriber [we’re not] you can read the review, otherwise try the Independent. It reminded us that we hadn’t yet included The Ivy. Hidden down West Street in Soho, this institution has seen its fair share of celebrities over the years and you don’t count if you haven’t been photographed stepping out of the Ivy into a taxi [or vice versa]. At the height of its fame there were tables that were suitable for celebrities and then there was “Siberia”, the tables set a tier or so back for the ordinary people. We’ve eaten at both, and at one of the funny little tables just in the door in front of the bar for late comers – a bit like eating at the bar in J Sheekey. What really reminded us was  seeing the new Ivy Grill taking shape near the Covent Garden Market and  the news that the Ivy is closing for a “make-over”. 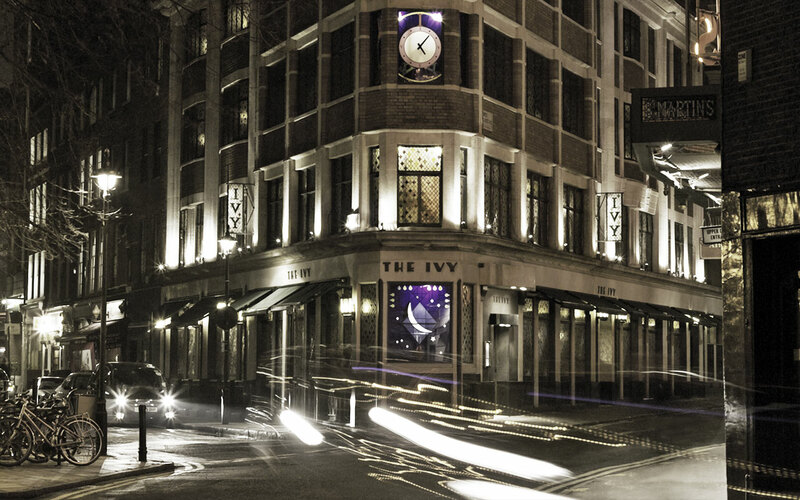 The interior design of the Ivy is legendary, dark and traditional yet lined with paintings from a range of modern and contemporary artists. 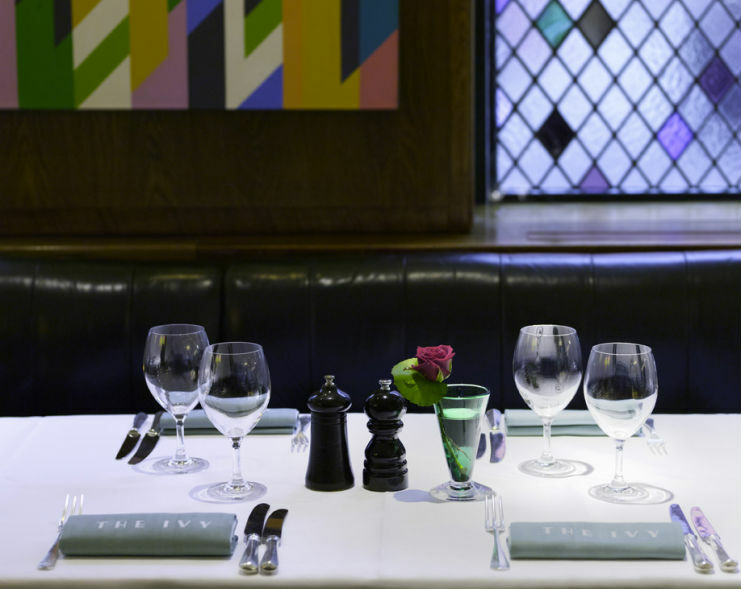 The restaurant was totally renovated 25 years ago to a design by American architect M.J. Long incorporating specially-commissioned artworks by Sir Eduardo Paolozzi, Sir Peter Blake, Sir Howard Hodgkin, Bridget Riley, Allen Jones, Joe Tilson, Patrick Caulfield, Michael Craig-Martin and Tom Phillips. The food – well, it’s just what you want. We took our sons for a memorable birthday. One ordered Steak Tartare, followed by Meatloaf. The waiter was kind enough to suggest that, whilst wholly supporting a carnivorous lifestyle, perhaps there might be other choices that would go better together? Simple, wholesome but with some secrets. We’ve tried to make the tomato tart on a number of occasions, perfecting it a little each time. When we served it to some friends recently as a starter they said “oh, pizza?” Really, some people. So, it’s probably a bit like italian wine – absolutely marvellous when you’re there but doesn’t quite taste the same at home. Nonetheless, the fishcakes with sorrel sauce do work [there’s a little pub near us that make them and we have them every time] and, best of all, the salsa that goes with the seared tuna. It goes with seared everything. Sausages even. Or on its own. If you want to try to make the tomato tart, try the recipe book The Ivy: The Restaurant and its Recipes, written by the restaurant critic A. A. Gill.